My closet is not a comforting place. When I enter it, I am overcome with anxiety. The sheer volume of clothes is enough to put me into a state of panic. I am also overwhelmed by the piles of clothes that are one or two sizes too small for me; the bargain purchases that I wore once; and the poorly made and misshapen clothes that make me feel like staying at home when I wear them. I have read a plethora of literature about decluttering and why it is so important. The experts claim that clearing out your closet helps to create a serene home. You should only keep the things that spark joy in your life. And keeping clothing that is too small for you actually interferes with your weight loss goals. So this is the year. I am determined to listen to the closet-cleaning gurus and do something about my own closet. Plus, springtime is the perfect time to do it because spring is all about starting fresh. Below, I am sharing my step-by-step plan with you. Step One: Remove any clothing that is too small. I am taking my own approach to this step and granting myself a six-month window. I know that the experts say that the goal is to remove clutter and to just get rid of it, but I actually have clothing that still has the tags on it! However, I agree that it does make me feel bad to look at it. Instead, I am going to box it up, label it and move it to our storage area in the basement. If after six months it still does not fit, it is going to charity. Step Two: Remove any clothing that has rips, holes or broken buttons or zippers. My advice to you is to have this clothing repaired if it something that you cannot live without. But don’t wait too long. I have several pieces of clothing that I adore that have holes or broken zippers. I have held onto them for years with the intention of fixing them. Now is the time to get rid of them. I will donate what I can, but the rest will be disposed of. And I will not just move them into my sewing room thinking that I will repurpose them in some way (because I will not ever). Step Three: Donate any clothing that does not make me feel fabulous. As I mentioned above, I have way too many articles of clothing that I just feel blah in. I wear them occasionally because I hate to let them just sit there, but then I always regret it throughout the day. 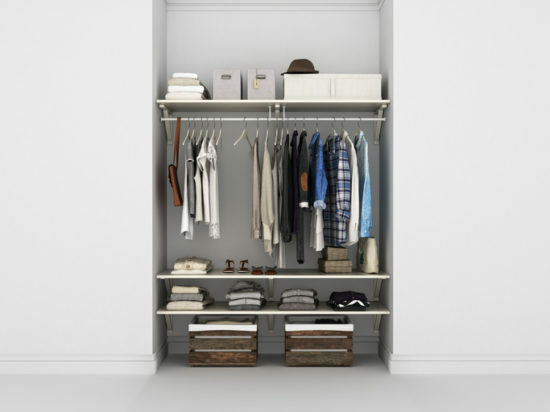 Some experts recommend organizing your closet in such a way that you can pay attention to which clothing you never wear. But the reality of it for me is that I know which clothing makes me feel unattractive or uncomfortable. All of it is going in the donation pile. Step Four: Avoid impulse buys. I am guilty of impulsive purchases. Something is on sale or catches my eye so I buy it and then regret it. And then I am too busy to return it or I don’t realize how much I dislike it until I’ve worn and washed it. One way I have dealt with this is to not go shopping unless I absolutely need something, and I do a lot of online shopping when I do need something. If I see something that I think I want, I wait a few days before I actually buy it. And then if I do buy it, I leave it in the bag with the tags on for several days before wearing it. Step Five: When I do need new clothes, buy quality items. This is hard for me because I love a bargain. Who can resist a cute top for $9.99? It’s a lot more difficult to justify spending $100 on a shirt. Not that quality has to cost that much but often it does. You usually pay more for good stitching, organic materials and quality construction. But in the long run, quality clothing saves you money. It is less likely to rip or fall apart. It usually doesn’t stretch out in weird ways or fade in the wash. It isn’t full of pesticides or formaldehyde that make you itch or break out in a rash. And because it costs more, you are usually more likely to buy only things you absolutely love. Plus, many companies offer super long or even lifetime warranties on their clothing (see this list). I am already pretty good about choosing quality brands for my shoes and my underwear. I have a pair of Camper shoes that have been around for six years and still look great. I used to buy all new underwear once a year because I would buy whatever was on sale and it would fall apart within months. But now I choose organic, quality brands such as Pact Organic, and they are still in great shape after two years. The best part about choosing great brands is that they are often made with sustainable materials and with fair trade practices, so you can feel extra good about your purchases. I hope that my commitment to change inspires all of you and that you are able to create happy closets!